Garrett Leight Wilson - Matte Butterscotch + Clip (Eye) Need Help? 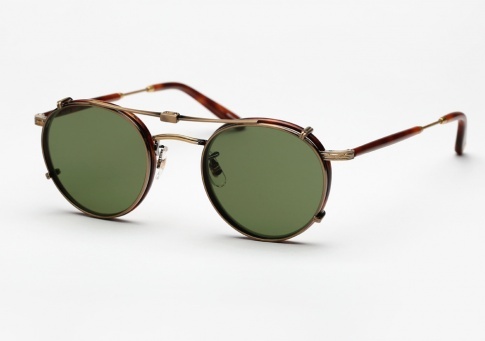 The GLCO Wilson is inspired by the classic British Health Insurance frame worn by The Beatles John Lennon. None of the originality in the technical design of this frame was spared. Original Italian Windsor rims, detailed metal filigree, mixed antiqued metal is representative of the true spirit of this timeless British classic. Wear it as a sunglass or an eyeglass. Originality and versatility is taken a step further with the addition of Garrett Leight's signature metal foldable sunglass clip-on lenses. Worth noting, in addition to the standard GLCO frame case and packaging, the clip-on lenses also come in their own specially designed compact leather pouch for easy transport and storage. A very nice touch. It is offered here with a "Matte Butterscotch" front paired with "Dark Honey Tortoise" temples and antique gold metal, elegantly complemented by an antique gold metal clip with G15 green lenses. Italian windsor rim over detailed metal filigree.